It seems that our family's birthdays all bunch up from the middle of the year to around the holidays. My granddaughter, Lindsie, is having hers this week-end with a party/sleepover with a few of her school friends and all the cousins --- What fun!!! The last time this happened, these little girls were up until about 2 or 3 o'clock in the morning!! I begged off on the sleepover as it is waaaaaaayyyyyy after my bedtime!! Anyway, I have been thinking about using all of these stamps and finally woke up at 4 a.m. (having gone to bed at about 8:30 the night before) and had to start on the card. The layout was a little difficult vowing to use ALL of these elements. 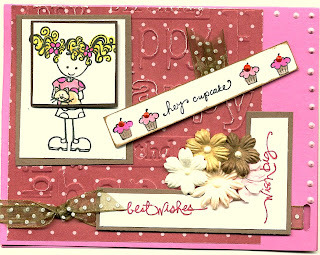 I don't think I missed any of my embellishments on this one .... MORE IS BETTER in this case, don't you think? I know Lindsie will like all of the "stuff" on here. The theme of the party is movies and film .. guess what I got for her?!?! Kung Fu Panda and Wall-E!! Thank you for stopping by this morning and come back real soon ... I'll probably have yet another birthday card to post!! oh my goodness!! how cute is this! yep--sometimes more is MORE!! she's going to love it!